Mark Massie, 59, stands at a popular panhandling spot in Cascade Township in suburban Grand Rapids.The township is considering a law regulating panhandling. Busy 28th Street in Grand Rapids is prime commercial real estate, lined with a miles-long procession of strip malls, big box stores and the occasional gas station. Asked what brought him to this corner, Alex told a complicated story about recent troubles that included his car breaking down, the theft of his stepfather's truck and a bank’s repossession of his grandfather's house – where he and family had been staying. For now, Alex, his mother and stepfather were living in a nearby motel. He said he needed to scrape up $50 a day to pay the bill. “I can usually make that,” he said. Across the street, in Kentwood, Alex would be banned from soliciting money. Kentwood, like nearby Alpine Township, Walker, Grandville and Wyoming, prohibits panhandling to motorists. Cascade Township, a Grand Rapids suburb, and Norton Shores, a Muskegon suburb, are also weighing panhandling measures. 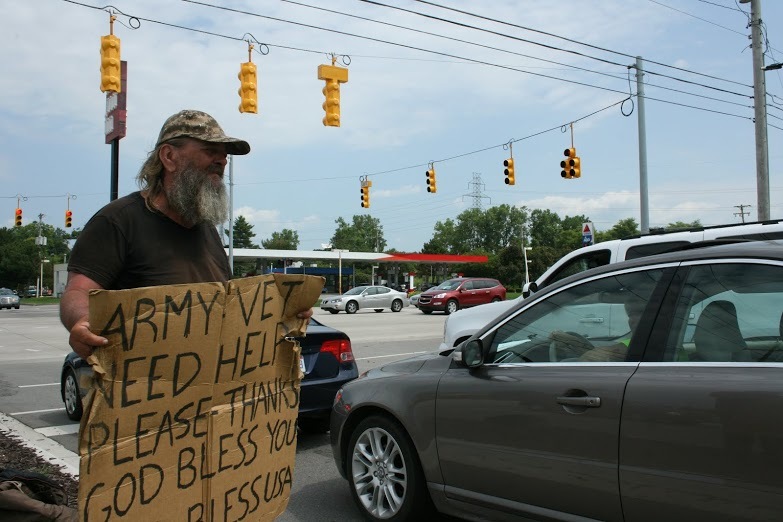 In June, Grand Rapids commissioners deadlocked 3-3 on an ordinance to ban begging from motorists, leaving panhandlers like Alex free to ply their trade at street corners around the city. Heartwell expects the city commission to reconsider a panhandling ordinance within months. That could include not only a prohibition on panhandling from motorists but a ban on panhandling within 15 feet of a public restroom, bank or ATM machine, bus stop or from anybody waiting in line to enter a building. And so communities across Michigan continue to wrestle with an issue that poses tricky legal and moral questions, particularly in the wake of a 2013 federal appeals court ruling that struck down a Michigan law criminalizing begging. The court said that charitable solicitations are protected under the First Amendment, whether someone is seeking money for themselves (a panhandler) or a third party (such as a charity seeking donations). The Sixth Circuit ruling stemmed from a lawsuit brought by the American Civil Liberties Union of Michigan on behalf of two Grand Rapids panhandlers. The ACLU has fought anti-begging laws in the state for more than a decade. In striking down the Michigan law, the court noted that cities may regulate begging, but any such restrictions must be “narrowly drawn” to preserve First Amendment freedoms. In February, the ACLU filed another suit to overturn a similar ordinance in Waterford Township in Oakland County. The township had replaced a blanket ban on begging with one that restricts panhandling in specific locations, including near banks, within 20 feet of an ATM and on private property where signs are posted to prohibit begging. Panhandling is but one component of the larger issue of poverty, with 1.6 million Michigan residents now falling into this category. The Center for Michigan’s recent report, “Michigan Speaks: The Citizen’s Agenda for the 2014 Elections,” identified poverty as one of the top issues facing political candidates this year. In polling and community conversations with more than 5,500 people,residents across all demographic groups said fighting poverty should be an urgent priority for the state. Attorney Miriam Aukerman of ACLU Michigan said the organization continues to monitor how communities deal with panhandling. Cities get into trouble, she said, when, for instance, they ban panhandlers from approaching motorists, while allowing others to do so. She noted that some towns allow high school kids to wave down traffic for school car washes, or allow Salvation Army volunteers to ring bells on sidewalks. Merchants hire sign-holders to stand on busy corners to attract business. “People hold up signs for all kinds of messages. The panhandler is communicating a message that people don't necessarily want to hear. But the content of the message cannot be a reason to censor the message. Aukerman acknowledged it can be argued whether or not giving money to a panhandler is ultimately helpful to that person. But she argued it should be a choice in a free society. “The person has the freedom to ask and the passerby has the freedom to say no,” she said. Some homeless advocates argue that handing out cash to panhandlers does them no favors. “That's really a very unaccountable system of charity,” said Robert Lupton, founder of FCS Urban Ministries in Atlanta and the author of “Toxic Charity,” a 2011 book that questions deeply held assumptions about how to help the needy. Lupton contends that extending charity with no expectation of something in return erodes both human dignity and capacity. In his book, Lupton recalled a church mission project to dig a well for a remote Honduran village which had no nearby water supply. A year later, volunteers found the well broken. They fixed it. By the following year, it was broken again. Lupton said the experience typifies the unintended consequences that flow from one-way charity: The villagers believed it was not their well to maintain, but rather that of their saviors. “The village simply waited until their benefactors returned to fix their well,” he wrote. Anecdotal reports contend that some panhandlers make upwards of $200 a day, money that critics, including Michigan Attorney General Bill Schuette, assert is most often used to buy drugs or alcohol (In defending the state law, Schuette also argued that panhandlers often lie about being homeless, amounting to a fraud on sympathetic motorists). But studies of panhandling suggest a more complex profile, and more modest returns. A 2007 study of 107 panhandlers in the Las Vegas area found a median monthly income of $192. About 80 percent said they were homeless; 41 percent reported they were experiencing depression; 38 percent reported substance abuse problems and 17 percent had a mental illness. A 2013 study of 146 panhandlers in San Francisco found that that 60 percent made $25 a day or less. More than 90 percent reported that they used the money for food and 44 percent for drugs or alcohol. One in four were alcoholics and 32 percent were addicted to drugs. More than 80 percent were homeless; 53 percent said they panhandled seven days a week. In lobbying for panhandling restrictions, Grand Rapids business owners argued that whatever rights panhandlers enjoy do not extend to the point where they interfere with commerce. He recalled a motorist who stopped and screamed obscenities at him, telling him to get a job. If your going to do a story on panhandling, I think it would be beneficial to include stories or data on what I call aggressive or violent panhandling. This is where you are accosted by people on the street looking for a handout. The solicited party either doesn't respond or says no and then is verbally and sometimes physically confronted. I think that his happens way more than is reported and shouldn't be something that law abiding citizens should have to endure. Case in point, I was in Detroit a little while back and a exit ramp beggar was asking for money, I shook my head no and the woman started hitting my window. So she has a right to beg, do I have have a right to drive in peace? Why does society have to cede every off ramp to vagrants? Why do might rights to walk down a city street end with someone else's rights to verbally harass me for a financial shake down? Encountering panhandlers is part of dealing with real life. Face squarely up to the problem of pervasive poverty in our communities, and maybe you won't be so offended when you are reminded of it. Do something voluntarily that puts you in contact with people who are having life experiences different from yours. On a recent visit to my former hometown of Ann Arbor, in a very short few blocks, there were no less than 1/2 doz. "pan handlers" -- when inquiring about this I heard from a local that Ann Arbor has so many organizations that provide services to the homeless that it attracts more and more -- if that's the case than why are they still on the streets asking for money???? Most recently I stopped and asked a well dressed man, standing on the side of a busy suburban Detroit city, with a sign indicating he was a veteran and just trying to make ends meet w/ his disabled elderly father that lived with him, about his stiuation....that's when he indicated that he was a "lone" family member trying to make ends meet, provide day care for his disabled father, etc. while he also has a full time job.....days later he was still out there, I gave him some money and a list of resources for folks needing assistance with senior care etc. -- to this day he is still standing out there....it has been almost a year. I am perplexed and saddened by the entire situation and I don't see any one solution to help the masses -- especially since some of these folks are in these positions, sadly, by choice. The article mentions high traffic roads such as 28th street, but fails to mention the risks that such activities can have on the people being solicitied. When does the discussion include the risks and consequences to others when panhandlers exercise their 'trade'? Mr. Roelofs seems to have a very narrow focus when he picks a topic, in this case it seems to ignore any potential unintended consequences. I wonder if he feels if the companies he purchases products from should be allowed to ignore the unintended consequences, should drug companies ignore the potential side effects. It seems Mr. Roelofs feels that the panhandlers have no responsibilities how they exercise their freedoms as the rest of us must do. I wonder if he even considered anything about others when he focused on the panhandlers.